Dental 3D Printing Materials Guide – SprintRay Inc.
3D printing has come to dentistry in a big way. But choosing the right printer for your practice or lab is about much more than just the hardware. There are a handful of printers on the market today with sufficient accuracy and speed to satisfy the needs of most dentists. As desktop stereolithographic (SLA) printers mature, the spec-sheets seem to be telling a story of converging capabilities and dental 3D printing materials. With the dental 3D printing market projected to reach $9.5 billion by 2027, the industry has been flooded with newcomers and wild claims about ROI and workflow enhancements. But this narrative of feature convergence and the creeping-in of jargon-laden features seriously complicates the purchasing decision. The daily introduction of new ‘features’ into existing lineups can give the impression that 3D printing is moving too quickly to justify investment. In a recent article, we made the case for what makes certain printers ‘dental’ and others not. But the printer hardware only tells part of the story. In order to cut through the noise around dental 3D printing, it’s crucial to understand the current market and projected future of dental 3D printing materials. While printer features such as accuracy and speed are important in dental manufacturing, it is a series of advancements in resins – driven by third-party manufacturers – that is largely responsible for the proliferation of 3D printing in dentistry. What is a Dental 3D Printing Material? When we talk about resin or other 3D printing technologies that are ‘dental’, what do we mean? If you want to cut through the noise in the 3D printing market, this is an extremely important question to ask. Compared to other 3D printing customers, dentists have unique and non-negotiable needs for their manufacturing systems. A dental 3D printing material is a resin designed and manufactured specifically for the production of final-placement dental appliances and functional dental models. You can’t 3D print dentures with just any materials. Specifically formulated PMMA resins open up a whole new world of 3D printing in dentistry. The fact of the matter is that not all resins are suitable for even basic study models. But although dental model resins are some of the most widely marketed materials in dentistry, models represent only a fraction of 3D printing’s capability in digital dentistry. Functional, final-placement appliances are growing in number, and these FDA-cleared, biocompatible resins are the future of the industry. When we get down to brass tacks, there are two categories of dental resins. At first blush, one might mistakenly think that the requirements of a dental model are the same as any other 3D-printed part. But where they diverge, and where we find the point of divergence of most dental prints from other 3D-printed models, is in their intended use. While a 3D model of a character to be used for animation will be heavily post-processed and painted by an artist, a full-arch model of a patient’s teeth needs to be useful with minimal effort. This cashes out in two ways. 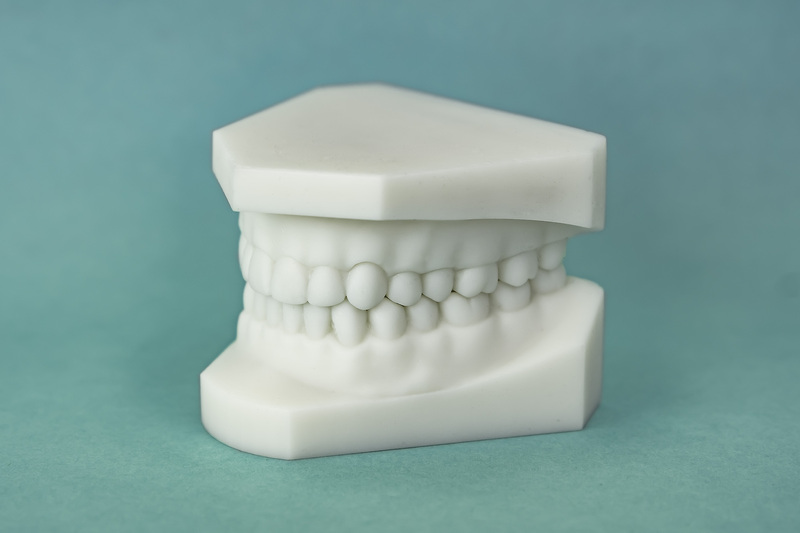 Dental model resins have many uses: teaching, restorative fitment tests, patient consultation, and the fabrication of clear aligners are just a few. Dental model resins need to properly balance speed against aesthetics. Doctors like Steven Shao use 3D printed dental models as visual aids for restorative treatment consultations. In order for these consultations to be effective, the models need to be visually appealing. Proper color distribution, especially over the course of long prints, is something that many standard model resins do not prioritize. Dr. Shao uses SprintRay Model Resins, which are specifically formulated to print rapidly while retaining even color and micron-level accuracy. 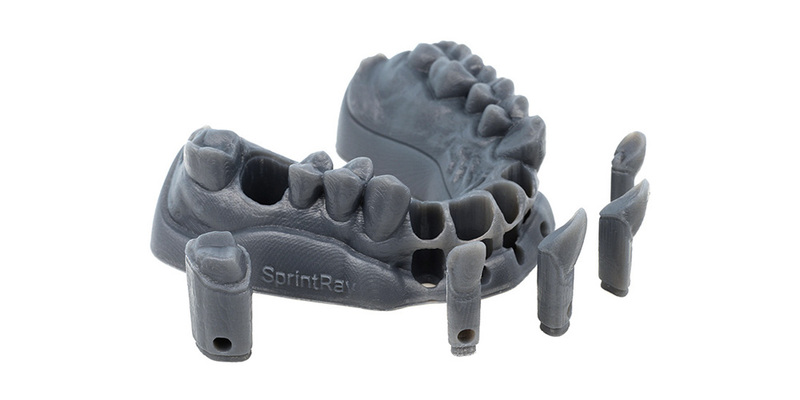 SprintRay’s white dental model resin is perfect for restorative mockups and patient consultations. Another popular use for 3D printers, particularly in private practices, is the creation of in-house clear aligners. 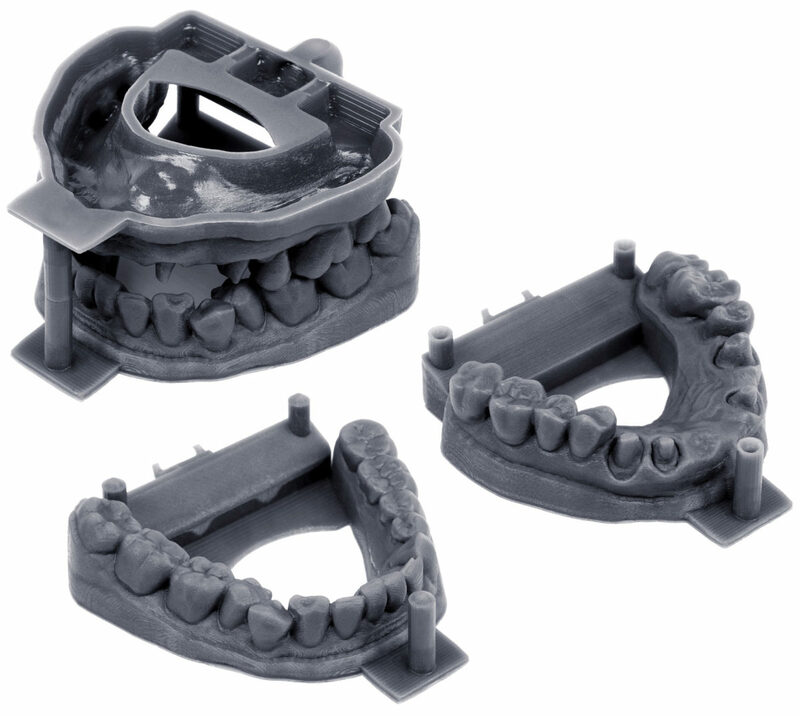 This process involves printing a handful of full-arch models that progress from a patient’s current to future dentition. Clear aligner therapy production brings up the most important component of dental model resin: accurate throughput. Many desktop SLA printers use a single laser to cure resin as if drawing a picture one layer at a time. 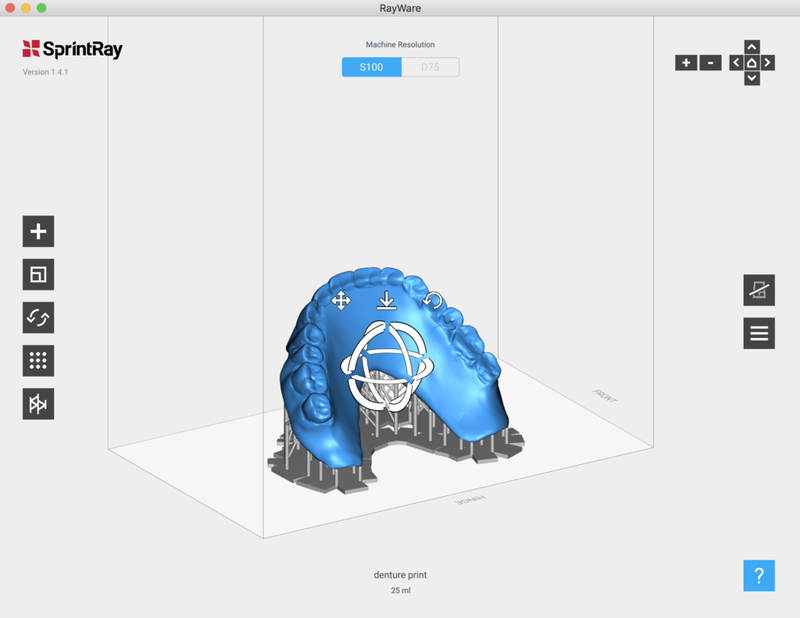 Desktop DLP printers like MoonRay cure an entire layer in a single flash of UV light. This makes them very accurate and fast, two items that are critical in the production of clear aligners. Because clear aligner therapy requires the printing of up to a dozen full arch models, throughput is crucial. Rather than having to print each arch on its own print bed or wait for each layer to be individually drawn, DLP printers can get the best of both worlds. But speedy, accurate production isn’t just about printer tech. Speed and accuracy are adversely affected by materials. Dental materials are engineered for this balance. 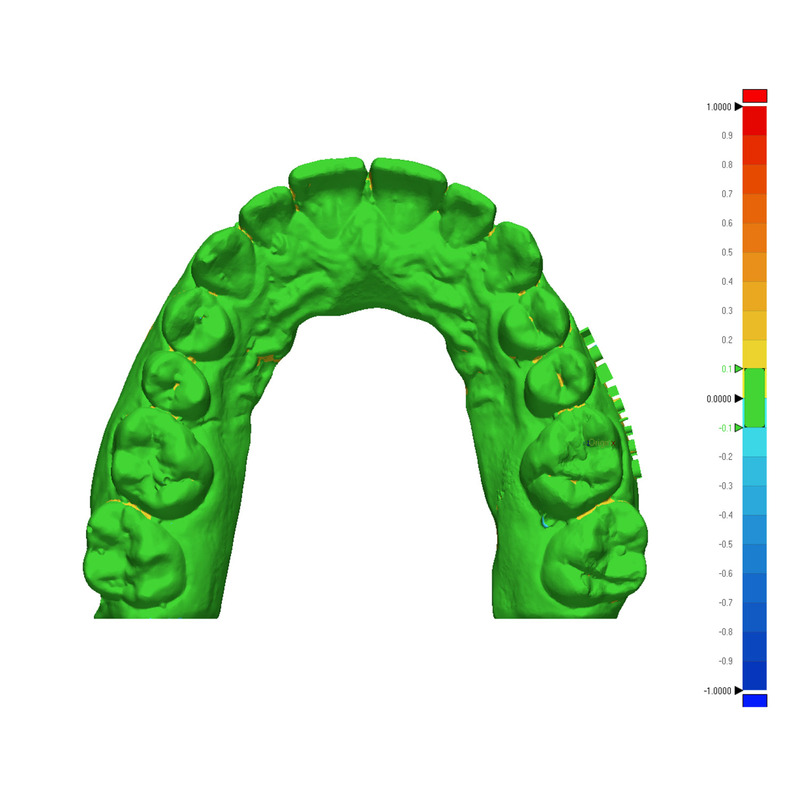 If the accuracy of the full-arch models isn’t spot-on, then the aligners themselves won’t fit properly. High throughput with reliable accuracy is the result of years of tweaking model resins specifically for the needs of dental professionals. At SprintRay, we conduct in-house studies to verify the accuracy of our dental model resins. The clinics and labs that use our materials know that they can count on our resins to produce accurate, repeatable results. The last couple of years have seen a handful of breakthrough resins that are certified by the FDA as Class Ia and IIa biocompatible. These new resins also have physical attributes that make them ideal for dental applications. Hard, clear plastic mouthguards and nightguards can be printed on certain compatible 3D printers. Indirect bonding trays, which are loaded with orthodontic brackets and then seated for simplified bonding, can be printed in less than an hour. 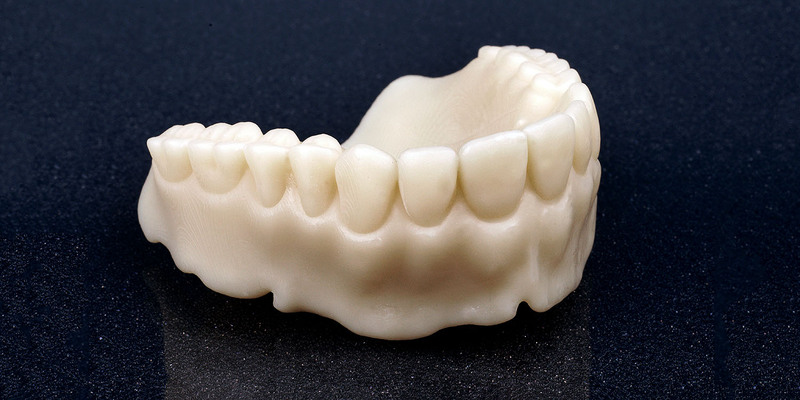 Denture try-ins and monolithic, economical dentures can be printed with PMMA micro-filled hybrid material, post-processed, and placed into a patient’s mouth within a day and for a fraction of the materials cost. 3D printed dentures are a breeze with the right hardware, software, and 3D printing materials. You might be thinking: great! If there are so many new functional resins on the market, why aren’t all digital dentists using them? Unfortunately, things aren’t so simple. Most systems are still “closed” which means it can be difficult to find the combination of product features and material compatibility that will work for your practice.. In order for a given printer to print with a certified denture base resin, for example, that printer must have the correct software presets. If it doesn’t, the print will fail. Just as with paper printers, the wide profit margins of consumable supplies drive company decisions around materials. Many dental 3D printing materials are made by third-party resin suppliers. Only a very small handful of 3D printers allow for third-party resins. Even fewer offer support and offer pre-made settings to ensure compatibility. Most 3D printers, even those built for dental, use proprietary ecosystems. If you invest in such a printer, you may limit your ability to see future returns on your hardware. If you want to use cutting-edge materials to fabricate final dental appliances in-house, then it really matters which 3D printing ecosystem you buy in to. 3D printers for dental clinics and labs should be long-term investments. While hardware iterations are on fairly long product cycles, dental 3D printing materials are not. Resin manufacturers move fast, and clinics need a partner who can help them stay up to date. Many of the functional resins on the market today have become available within the last year, and that rate of improvement shows no signs of slowing down. The success of 3D printing in dental owes much of its capability to these new resins developed by third parties. Crowns and bridges can be 3D printed on SprintRay hardware thanks to our open certified resin platform and commitment to certifying NextDent’s functional resins. This rapid pace of improvement can seem daunting. But buying into SprintRay’s printing platform is the beginning of a partnership that is one-of-a-kind in the industry. We offer an expanding catalog of fully supported third-party resins from leading manufacturers in addition to our own model and surgical guide resins. This means that you can buy with confidence, knowing that your printer and support team will always be up-to-date with the latest advancements in dental 3D printing materials. Certified: SprintRay’s product engineers work with resin manufacturers. We do the hard work of certifying and supporting these materials so that you can maximize your production flexibility. Open: While many competitors only offer a few resins for dental, SprintRay opens up our machines to the kinds of advancements in materials that truly revolutionize dentistry. Platform: Materials for dental 3D printing require testing, distribution, and support. SprintRay is fully committed to dental, so we offer a suite that fulfills all three of these. As the world of 3D printing continues to revolutionize dentistry, new materials will continue to push the envelope of what’s possible. 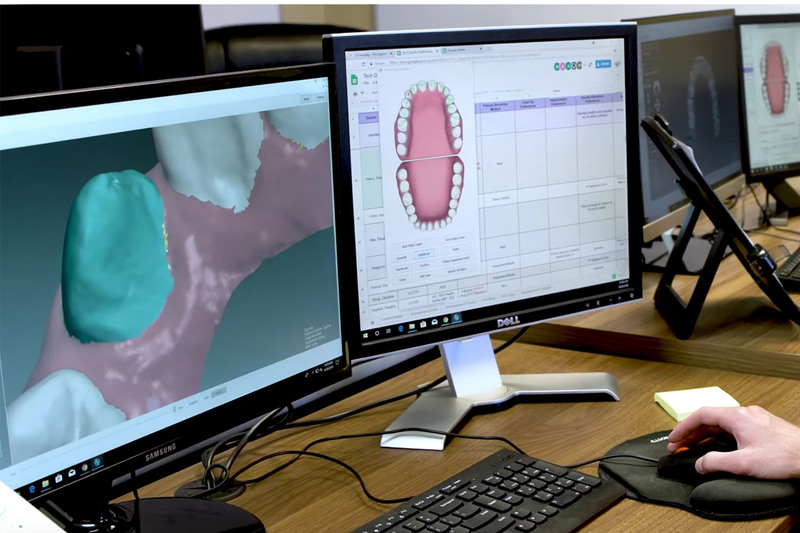 Because of our open certified resin platform, SprintRay is the ecosystem of choice for dentists and labs across the nation who want to secure the future of their investment in 3D printing. Further questions about how 3D printing can impact your practice? Our sales department has decades of experience in digital dentistry. Interested in seeing the quality of our prints for yourself? Request a free sample here.